Recently, JMC officially rolled out Kairui800HP truck equipped with Cummins ISF3.8L engine (a maximum 115 kW horsepower). 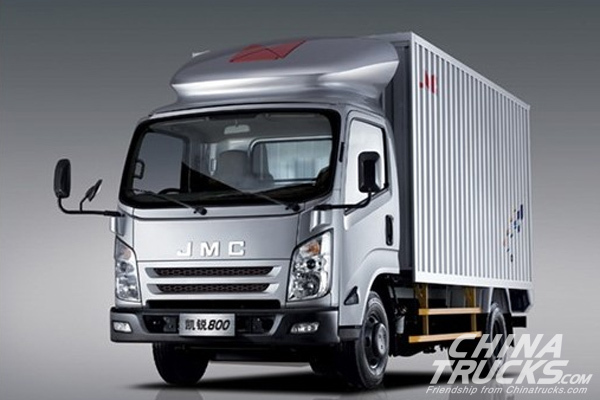 JMC Kairui 800H truck is equipped with Tengbao 3.0L engine with 152 horsepower (112 kW) and a torque of 382 N.m. The truck has already passed a wear test of 15,000 hours with 400,000 km smooth driving without major repairs. Although Kairui 800H achieves less power than that of Aulin CTX made by Foton, it achieves a higher fuel economy. In addition, it is equipped with a six-speed MYY6S transmission gearbox made by Germany-based GETRAG. With an all aluminum-alloy structure, the gearbox helps the truck achieve higher fuel economy and deliver more powerful performances.